Fine tuning one’s guitar tone is a process that can either be short and easy, or long tedious. Which one of these you are going to choose will mostly depend on how determined you are to reach that perfect balance, and how far you are willing to go. Does An EQ Have To Be Expensive? There are many ways to adjust the properties of your guitar tone. Everything starts with the tone knobs on your ax, only to be followed by whatever controls are available on the amp you are using. For a lot of guitar players, these two sets of controls are more than enough. This is especially true when you consider that each effect pedal comes with some sort of tone shaping feature. With that said, there are those who simply need to take things to a whole new level. In order to do so, they will use EQ pedals. These little stompboxes are designed to give you another level of control over your tone, and most of them act just as any other equalizer. Their performance and impact they are capable of having one the tone of any guitar, are the reason why EQ pedals are among the most essential pedals you can buy today. The dominant design choice seems to be the good old graphic, although there are other solutions available as well. Either way, today we are going to show you 6 of the best EQ pedals you can get at this moment. The models we have chosen are ones which we think deserve to be in every pedalboard out there, but we definitely don’t expect everyone to agree with us. With that said, let’s dig right in. One of the names that keep popping up whenever EQ pedals are being discussed, especially the top tier ones, is Empress. Their Para EQ pedal is currently sitting on the throne when it comes to most efficient ways of adjusting your tone by using a standalone guitar effects pedal. Aside from it being a high-quality unit, made to withstand a nuke if necessary, there are several pretty impressive reasons why this pedal enjoys the type of reputation it does. Let’s start things off by talking about its core performance. Empress ParaEQ utilizes a clinically accurate three band parametric EQ to give you ultimate control over a very well defined frequency range. The possibilities are borderline endless in terms of what you can do with this single pedal. Next thing that defines it is its ability to add 30 dB of boost where you see fit. Speaking of which, you can use the Empress ParaEQ as a boost pedal as well, even when the EQ part of the effect is completely bypassed using true bypass that comes as standard. All of these things combined make a very effective and persuasive EQ pedal that really packs a mighty punch. If you need the ultimate control over your tone, this the model you want to look at first. Somewhat contrary to the pedal we have just talked about, MXR delivers one of the best pedals of this type, only their approach is a bit different. Instead of building a behemoth of a pedal that as expensive as it is good, MXR toned things down a bit and delivered a great package that stands out due to its balance of price and performance. Interestingly enough, even though it is not nearly as refined as some of the more expensive models on the market, MXR’s 6 Band EQ still manages to push out a performance worthy of every praise. In fact, it is so good that people tend to prefer it over a much more complex 10 Band EQ made by the same company. The layout of controls for this model is based on your standard graphic equalizer most audiophiles are familiar with. The frequency bands supported by this pedal are somewhat optimized for guitar tone, and allow the user to scoop those mids with little to no effort. On top of that, there’s approximately 18 dB of boost available in this little affordable box. While it might be too rugged for the most demanding users out there, most of us are more than happy with the kind of performance this thing has to offer. From a purely practical point of view, EarthQuaker Devices Tone Job EQ is considered to be an equalizer by most guitarists who have used one of these pedals. Looking at it, it’s not that hard to see why. With that said, EarthQuaker Devices Tone Job is not your standard equalizer pedal either. It is actually a well thought out fusion of two rather great effects. You get a booster pedal that also packs a serious EQ capability. Compared to the previous two models we have talked about, you might feel a bit unimpressed once you glance over the available controls. After all, can you really do that much tone shaping with those standard Treble, Mid, and Bass knobs? The answer is yes. What EarthQuaker Devices have achieved with this model is to give you a very simplified way of controlling your tone while still retaining the range you would get with a regular EQ pedal. There’s 20 dB of boost or cut to play with in each of the three available bands. Speaking of which, these bands are not that rigid, and come with a decent overlap among them. Aside from all of this, that Level knob is capable of boosting the entire signal up to five times its original volume. That is what you call versatility. There is a lot to be said about Boss and their very utilitarian effects pedals. In most cases, if you are not sure which pedal to go for, you can always turn to the model Boss has to offer and you will most likely be taken care of. That is just how this company operates. With that said, it’s not really that shocking that their EQ pedal is among the best in the business at the moment. One look at this EQ will tell you it’s a standard Boss enclosure. That same one that has been proven to be able to take all kinds of abuse and still keep working at the end of the day. The only real difference this time is the graphical EQ with seven bars, and its white color. Yes, there are seven bars to work with, not including the master level. Considering how much this unit costs, that is actually quite a lot of versatility packed into what is essentially an affordable pedal. In terms of performance, everything’s solid. Boss GE-7 packs quite a bit of boost to offer. Whole 15 dB to be more exact. In practical terms, that is enough boost to push a tube amp into that natural overdrive. That’s a pretty awesome performance for an affordable package such as this one. All of the models we have shown you so far have been somewhat old-school in nature. What about something that is more closer to our current tech trends? This is where Source Audio SA170 Programmable EQ comes in. This awesome little EQ pedal brings a performance that is worthy of the hall of fame, all while delivering the most futuristic user experience within this segment of guitar effects pedals. So, what makes it so good? Let’s start with seven frequency bands which are perfectly optimized for guitar. If you are a bass player, don’t write this one off just yet. There is an additional band that you can activate which covers the 62Hz range. On top of that, you get four different presets you can store and recall whenever you want to. The pedal brings 12 dB of cut/boost into your signal chain, as well as some unusual features for an EQ effect. If you go through the controls, you will find an Auto-scroll feature. When activated, the pedal will shift between your presets at a speed you can adjust, thus creating a unique type of effect that resembles tremolo pedals in a way. Honestly, there is nothing usual about this EQ, which is why it’s one of the best out there. Now that we have reached the end of our list, we have a very special EQ pedal to show you. This thing is definitely not on the same level as the models we have mentioned so far. Danelectro is known for delivering some of the cheapest guitar effects pedals you can find on the market. However, that definitely doesn’t mean that there is anything inherently wrong with these pedals. They might be a bit rough around the edges, maybe even lacking the necessary durability at times, but they are absolute rulers of the affordable range within their respective categories. 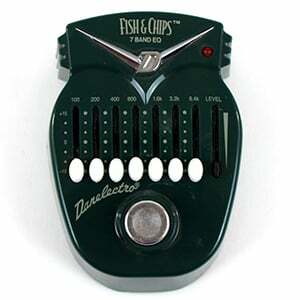 Danelectro DJ-14C Fish & Chips is by far the cheapest EQ pedal you can get that will still deliver some sort of quality performance. You get seven bands to work with, which are controlled by decently well-made sliders. These are complemented by an additional level slider. Fish & Chips brings a very basic configuration, but one that has been proven to work so many times by now. One thing you definitely want to keep in mind is that you should treat this pedal as if it’s made of glass. Seriously, if you stomp it a bit harder, chances are it will break in some way. In many ways, you can’t really call an EQ pedal a guitar effect. While it definitely shares the enclosure and format many of the most popular guitar effects do, it’s hardly an effect in the real sense of that term. An EQ pedal is first and foremost a tool that allows you to alter the very nature of your guitar’s tone core. Whether you go for a graphic EQ, parametric one, or just about any other type out there, you are essentially cutting off and boosting different parts of that signal’s frequency range. Most basic EQs will offer only three bands to work with, while those more advanced ones can have anywhere from six to ten or more bands. While some guitar players might wonder what’s the point of having a pedal of this type if you already have all of those controls on your amp, you definitely need to spend some time with an EQ pedal to truly understand. Once you do, chances are you will wonder how you ever played guitar without it. And just to make it clear, EQ pedals are not reserved for electric guitars. No, you can use them with acoustic-electric models as well as bass guitars. Wherever there is a need for some type of tone correction, EQ pedals are going to be useful. If there was ever an underestimated guitar pedal, it is the EQ. It is quite impressive how useful it is to have one of these in your signal chain but also how few guitar players actually use one. After all, if you really think about it, every piece of music recording is being pushed through an EQ of some kind. With a pedal, you have the ability to fine tune your tone to new levels for a live performance. Most of the issues with EQ come from this misconception that these pedals are hard to use. Sure, they are not your regular on/off type of deal but you don’t need a pHd in quantum physics in order to figure one out. Adding an EQ is often that final piece of the puzzle. There are countless stories of guitar players dialing in a borderline perfect tone, spending several years trying to work out that final kink, only to try out an EQ one day. This usually fixes whatever minor imperfections there were. So, EQ pedals are easily one of the best tools you can have in your kit. They may not be as overt as distortion pedals or similar effects. However, EQs are the type of effect that is only blatantly apparent if its not doing a good job. The beauty of an EQ pedal is that it can be super simple or really complex depending on what you want. If you have ever seen a guitar amp of any kind, you are most likely familiar with two band or three band EQs. The most common setup is to have treble, mids and bass controls. With two band EQs, those controls are reduced to bass and treble. However, you can go the other way too. There are six band EQs and more complex platforms than that. One of the biggest classifications of EQ pedals has to do with the control layout more than anything. There are pedals that utilize knobs and there are those that have a graphical EQ layout. Latter are particularly interesting because they make things rather simple. You have frequency bands clearly labeled with graphs showing you just how much boost or cut you can count on. When you are working with a knob type EQ, those values are easy to forget sometimes. The answer is maybe. With EQs, investing more money generally means having a more precise instrument at your disposal. This is where a big disclaimer comes in. You absolutely don’t need to spend large amounts of money in order to have decent equalizer pedal in your signal chain. Truth be told, an affordable EQ is a great way to introduce yourself with this type of pedal and learn how to use it. When it comes to higher end models, some of their price comes from various features. If we takeSource Audio SA170 as an example, we can see that it is much more than just a graphic EQ. Instead, you have all kinds of programming options and versatile features that go beyond your regular format. It is much better to get a proven affordable model now than it is to save for that awesome space shuttle unit everyone’s talking about. After all, there is no replacement for hands­ on experience. That stands true for other pedals as well, such as compressors or noise gates. Where most other pedals have a somewhat canon position in a signal chain, EQs don’t. There are currently two dominant schools of thought regarding EQ positioning. One side likes them before their dirt, aka overdrives, distortions and such. The other side likes them after. Truth is that EQ placement is highly dependent on your amp, effects and guitar. You will often see people using more than one EQ at various positions in the signal chain. That is an option as well. If you are looking for a good place to start, go with either before or after dirt. That is the safest bet at the moment. Once you feel more confident, we highly encourage you to keep experimenting. Chances are that you will find that perfect position where your new EQ achieves best efficiency. In reality, it is much more important how you use the EQ. Lets get to that portion of the guide and see what some of the standard practices are at the moment. Without trying to scare you away from EQs, using them properly is almost an art form. The thing is that EQs aren’t too difficult to figure out, but you got to have that feel and knack for actually hearing it in effect. A good starting point is to have your EQ pedal set at zero value. That means that knob type EQs should have all controls pushed to the counter clockwise position, but don’t mistakenly drop a graphic EQ all the way down. If you do that, you will actually cut all the frequencies for about ­10dB or ­12dB depending on how much head space your EQ offers. What you want is to put all of the sliders at 0dB. This gives you fully transparent tone that isn’t affected by the EQ at all. Every equalizer has controls that can be divided into three main frequency bands. You have bass, mids and trebles. Bass is where you build the girth of your tone. With that said, it is highly recommended to make small adjustments from the baseline value. Trebles are the opposite of bass. Trebles are very sensitive and add that bite to your tone. Do your best to adjust trebles very carefully. You don’t want to add much boost over 10000Hz. Lastly we have mids. Many consider mids to be the main support of your guitar tone. You want to have them working in cohesion with both bass and trebles. Again, all of this takes practice and time. Soon enough you will gain a feel for what each frequency band does to your tone, making it easy to apply quick adjustments where necessary. At the end of the day, EQ pedals are something you will eventually learn to appreciate. As you develop your guitar skills and your sense for a good tone, EQ pedals are going to go from being a cool addition to your collection to a real tool that can open up some possibilities which won’t be available otherwise. No matter how dramatic this statement might sound. it’s completely true. If you think about it, every other aspect of music or audio engineering heavily relies on equalization for one reason or another. Why should guitars be any different? Learning how to use an EQ pedal early on can only help you achieve the best tone you could get with your current setup.